Participating in running races is extremely beneficial for a triathlete in the throes of their off season. Many triathletes view running as their weak link. Training for a run specific race is a golden opportunity for improvement without the worry of sacrificing bike training. This is the time to work on your run form as well as increase volume, intensity and frequency of runs. This should be accomplished in a systematic manner to avoid injury (that is where a good coach can be useful). When it comes time for race day, a plan is very important. It is very easy to ignore some obvious things because, well, it is just a running a race. That cavalier attitude can get you into trouble, though. You should approach a running race with the same precision that you execute a triathlon. Do not ignore your race day nutrition. My friend ran the Denver marathon as a training run for a marathon a month later (let’s ignore that this is generally not a great idea). The day before the race I asked about his nutritional plan. He had none. He was going to skip breakfast and had no gels and no salt tablets for the race. I tried to educate him about proper race day nutrition and gave him some supplies. Since he had not trained with any of these things, he became nauseous during the latter part of the run and causing bonking and cramping. A good lesson learned before the next marathon. Marathon and to a lesser extent, half marathon, nutrition is extremely important. Since you will be running at a pace faster than your triathlon pace, your stomach will react differently than during a triathlon. It is important to determine your caloric, liquid and electrolyte needs and practice them during your training runs. Even though you will be out there for less time than a half of full Ironman, nutritional disasters still loom. Believe me, I have stood in line at a porta-potty during a marathon (do you get to take the wait time off your final time?) and have frantically searched for the bathroom upon completion of a half marathon. I had two athletes run half marathons over the weekend. Before the race we discussed their goal times. Both asked what I thought they could run. I countered by asking them what they thought they could run. I wanted to know if they had a realistic perception of what they could do (they did). Once we determined the mile pace, we formulated a game plan (more on that in the section below). Undoubtedly, when you start to train for a running a race, you set a goal in your mind and tailored your training to achieve this time. Perhaps you are aiming for a PR. Maybe it is based on times from a triathlon. In any case, your training should indicate whether this time is achievable. Did your training cohere with this objective? Were you able to execute your intervals and long runs? Is your body healthy? Training does not lie and is the single best indicator of race performance. Set an unrealistic goal time and be prepared for a very tough race. Dropping 45 minutes off a marathon time is probably not reasonable. Starting off at this much faster pace will inevitably result in a painful last few miles. Proper race execution: Negative split or even split whenever possible. Your preparation is naught if you do not execute the race well. Running races are tricky for triathletes. We are not used to feeling so good. Remove the swim and bike and suddenly the legs are very fresh leading to overzealous running at the start of the race with a certain amount of fade as the miles progress. This problem is so universal a website calculates your pace for a projected finish time with the option of adjusting for this fade! Take a lesson from elite runners. 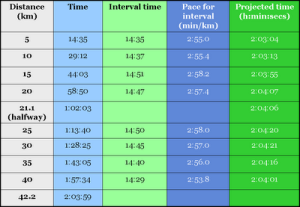 If you look at the splits from top marathoners and half marathoners, they even split or negative split their races. Check out these splits from Haile Gebrselassie’s world record in the marathon. Notice that he negative split the race and his last 5K was his fastest. Yes, I realize these times are ridiculously fast and incomprehensible to us mere mortals. But, the idea is applicable to everyone. Running a race with even or negative splits is physically and psychologically easier. Who wants to stand at the start line hoping that today they don’t blow up and have to shuffle to the finish? Hopefully you will now feel inspired to run. If nothing else, the logistics of a running race make the whole thing lucrative. No transitions. No bike gear. No wetsuit. What’s not to like? Excellent advice! I shuffled the end of my first marathon because I was a bit too ambitious on my projected pace. It was sad watching all the pace groups pass me the last few miles… Even though I started “slow” it was still too fast for how I trained on my long runs and should one really try to BQ in their first marathon? Lesson learned. I should have known better! Thank goodness I didn’t have any nutritional issues – I always have a nutrition plan that I test during training. Perfect timing on your post. Can’t wait to knock out my first marathon this Saturday with a focus on even splits. this past Sat I fell into the triathlete trap of burning through the first 9 of my 18 miler with fresh legs and then dying slowly each mile after that. It wasn’t a pretty finish! For someone yet to race an IM, how does this differ for an Ironman, if at all? Thanks for the advice! I have a friend I’m training for the Seattle Marathon via phone and text, and she mentioned she was very “crampy” after her long run this week. Turns out she didn’t take in any nutrition or electrolytes during an 18 mi. run. This is something she knows better than to do in a race, but completely forgot for training! This type of pacing applies to an IM as well. Better to start of easy and build into it than start off too hard and struggle. Not many people finish an IM and wish they went harder! Well said. My run (seasons of late) has been awful (injury and laziness). This fall/winter I’m working with my coach to be “a runner with an interest in triathlon”. See you at the races! Thanks for sharing your race wisdom Joanna! On a hilly course, it is best to run strong up the hill, but not anaerobic. The effort should be just slightly harder than the the flats. Then, you do not have to recover at the top and you can run faster down the hill. Practice both the up and downhill in training. Also, you can read my post on downhill running. Next story Come on in…the water is fine!